and photographed. You have all the comforts of home; deluxe accommodation, set in the forests, mountain parklands and open savannah, along with excellent food and the excitement of seeing wildlife in its natural habitat. The following itinerary represents one of our preferred programs. This module can be combined with our various options and extensions. Day 1 — Arrive in Nairobi, Kenya’s capital, where you will be met and transferred to your hotel. Balance of the day free to rest or see the sights. Day 2 — This morning depart Nairobi through Kikuyu country via Thika (the setting for Elspeth Huxley’s “The Flame Trees of Thika”) to the Aberdare Forest. The Forest is rich in wildlife - colobus monkeys in the canopy forest, herds of elephant and buffalo, the giant forest hog, numerous rhino and, if lucky, the rare bongo antelope. Day 3 — Today cross the equator to the Samburu Game Reserve, most northerly of the popular parks. Samburu is wilder and harsher than the parks to the south and has a kind of savage beauty. 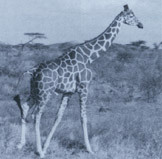 This area is noted for the unusual Grevy zebra, reticulated giraffe, and gerenuk (giraffe-necked antelope), along with ostrich, oryx and other animals adapted to life in dry conditions. Day 4 — Another day in Samburu Game Reserve. Day 5 — This morning safari to Lake Nakuru in the eastern Rift Valley. This area is known for its great concentrations of flamingo, numbering at times over a million, as well as many other species of water birds. There are several species of mammals in the surrounding acacia woodland, the most numerous being the lovely Defassa waterbuck. Day 6 — Depart the lake district and safari to Masai country to one of Kenya’s best-known reserves and richest wildlife sanctuaries. The Masai Mara is a vast area just north of the Serengeti with 700 square miles of savannah and patch forest. In the heart of Masai country game is rarely out of sight - huge herds of buffalo, knogoni, topi and wildebeest on the plains; baboons and bushbuck in the forest. But above all - black-maned lion! Here are the most abundant prides in Kenya. In the midst of wild splendor it is not unusual to encounter a Masai tending his herds. With nothing but a spear for protection, these people live in harmony with the environment and wild animals. Day 7 — Continue to view game. You may want to enjoy one of the following options: Balloon Safari or Lake Victoria Flying Safari. Day 8 — Return to Nairobi and continue your African adventure. Day 2 — This morning depart Nairobi through Kikuyu country via Thika (the setting for Elspeth Huxley’s ‘The Flame Trees of Thika’) to the Aberdare Forest. The Forest is rich in wildlife - colobus monkeys in the canopy forest, herds of elephant and buffalo, the giant forest, numerous rhino and, if lucky, the rare bongo antelope. Day 3 — Proceed to Nanyuki, where the luxurious Mt. Kenya Safari Club is set in the shadow of Mt. Kenya, amongst beautiful surroundings. Afternoon at leisure, to enjoy the resort’s many activities. Day 4 — Proceed to Lake Nakuru in the eastern Rift Valley. This area is known for its great concentrations of flamingo, numbering at times over a million, as well as many other species of water birds. There are several species of mammals in the surrounding acacia woodland, the most numerous being the lovely Defassa waterbuck. Day 5 — Depart the lake district and safari to Masai country to one of Kenya’s best-known reserves and richest wildlife sanctuaries. Day 6 — Continue to view game. You may want to enjoy one of the following options: Balloon Safari or Lake Victoria Flying Safari. Day 7 — Return to Nairobi and continue your African adventure. Wing Safaris are available for those who prefer to eliminate the drives between the parks, or who are on a tight schedule. Wing Safaris are available to Amboseli, the Masai Mara, Samburu and Lake Turkana. These can be incorporated into our longer safaris. Day 1 — Drive across the Athi Plains to Amboseli, passing the occasional Masai herdsman tending his cattle. You will have lunch and then afternoon gameviewing in the Park, excellent for photographing rhino, lion, giraffe and many other wild animals, with the snow-covered peak of Kilimanjaro in the background. Day 2 — After breakfast, gameviewing in the Park. Return to Nairobi before lunch. (NOTE: The same program with lunch at Amboseli and an afternoon safari can be done. Day — 2 Early morning game viewing in the Park. After breakfast proceed to Tsavo, driving across the Chuyulu Hills and Lava Flow. Lunch and afternoon game drive in the Park, the largest in East Africa, including a visit to Mzima Springs. Day — 3 After breakfast drive in the Park. After lunch return to Nairobi, arriving approximately 6:00PM. MOMBASA What better way to end a safari than to spend a few days relaxing on a beach. Day — 1 Depart Nairobi for the coast. You will be met upon arrival and transferred to your hotel, located along the beach. The afternoon is at leisure to enjoy the coral coast or hotel pool. Day — 2 The entire day is at leisure to explore the coast or relax. You may decide to take one of the many excursions, ie the Marine National Park, the 15th-century Arab ruins at Gedi, or visit Shimba Hills Reserve to look for roan and sable antelope. Lamu is located on the Kenya coast, 150 miles north of Mombasa. A visit here is like turning back the clock; life continues much as it must have in countless Swahili towns for centuries. The decorative carved doors and plaster work are a distinctive art form, and the Lamu Museum has unique displays about the regions history, sailing vessels and crafts. Lamu may be reached by scheduled air service directly from both Nairobi and Mombasa, and may be visited alone or combined with a stay in Mombasa. There are many adventure excursions available in Kenya. These can be included in your basic safari or combined with other modules to make your own itinerary. Weather conditions in Kenya and Tanzania have little change in season because of their location on the equator, and since much of the travel is within higher altitudes, the climate is very comfortable. The cooler months are June, July and August, considered their winter, with daytime highs in the 70s and evening lows in the 50s. The wildebeeste migration generally takes place in the Masai Mara from late July through September. September, October and November are a springtime of blossoms and young animals, with warm days and cool evenings. December January, February and March are the summer months, with days in the mid-80s, a non-humid heat. Migration is in the Serengeti of Tanzania at this time. Mid-April and May are considered the rainy months. The amount of rain is unpredictable and travelers often enjoy this season of reduced tourism. There are many different styles of accommodation, below is just a small sample of what is available. MASAI MARA: Keekorok Lodge, Mara Serena Lodge, Governors Camp, Mara Intrepids Club, Kichwa Tembo, Kotters etc. NAIROBI: Norfolk Hotel, Hilton Hotel, Nairobi Safari Club, Windsor Golf & CC, Stanley Hotel, etc. SAMBURU Larsens Camp, Samburu Intrepids, Samburu Serena Lodge, etc. MOMBASA: Nyali Beach Hotel, Serena Beach Hotel, White Sands Hotel, etc.